Retail REITs have significantly underperformed the rest of the market as rising interest rate fears and growing Internet competition weigh heavily on brick-and-mortar retail properties. 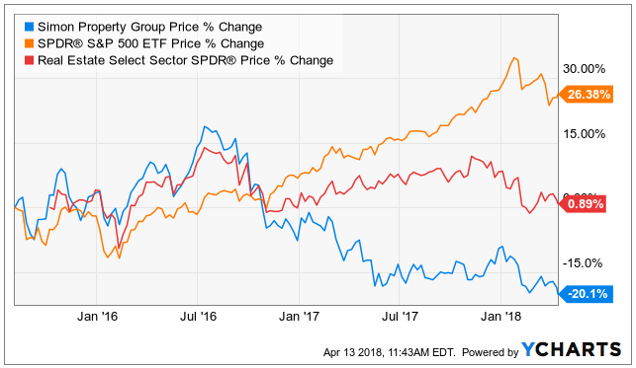 This article reviews the current state of one retail REIT in particular, Simon Property Group (SPG), and then concludes with our views on whether it’s safe to add shares of this depressed high-yielder (+5%) or if it’s just a dangerous value trap to be avoided. Simon owns, manages and develops retail real estate. It’s a member of the S&P 100, and its current market cap is approximately $54 billion. It’s organized as a real estate investment trust (“REIT”), and it generates the majority of its operating income (79.9%) from premium outlet malls, with the remainder from “The Mills” (11.1%) and international (9.0%). Simon’s share price has significantly underperformed the market (as shown in the following chart) due in large part to two very negative narratives. For starters, because Simon is a REIT, it must pay out 90% of its income as dividends for tax reasons, and this means it relies on borrowing to fund growth. The problem is that the cost of borrowing has been rising, and it is expected to keep rising, as interest rates are on an upward trajectory. This higher cost of borrowing has thoroughly spooked a lot of investors as they’ve been shunning REITs like Simon, in favor of other less interest-rate-sensitive market sectors. And in particular, the Fed’s minutes released this week showed discussions of a “slightly steeper” rate of future rate hikes, thereby causing SPG to sell-off ever further in recent days. Secondly, there is a frightening narrative that Internet retailers (such as Amazon (AMZN)) are going to put all brick-and-mortal retailers our of businesses. And this narrative has been powerful as Amazon’s business continues to thrive (even though Amazon does other things besides online retail—Amazon Web Services is enormous), and many retailers (i.e. the stores that rent space from REITs) continue to struggle (e.g. bankruptcies, store closings, rent concessions).